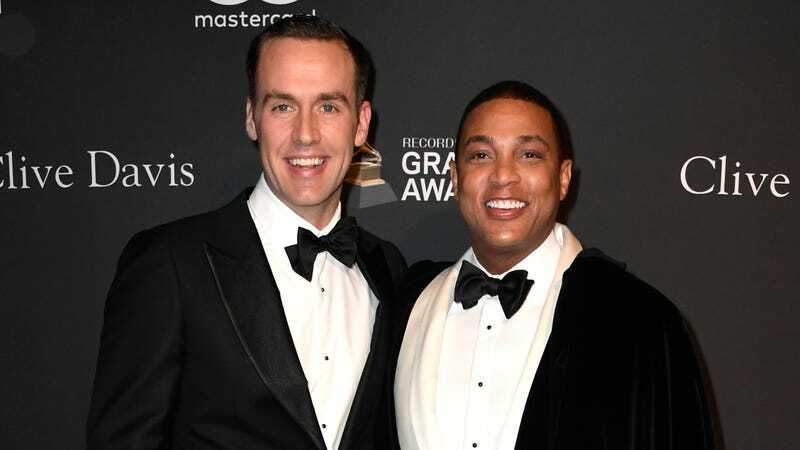 Tim Malone (L) and Don Lemon attend the Pre-GRAMMY Gala and GRAMMY Salute to Industry Icons at The Beverly Hilton Hotel on February 9, 2019 in Beverly Hills, California. Here’s a celebrity wedding to keep an eye out for: CNN’s Don Lemon is officially engaged. The 53-year-old host of Tonight with Don Lemon announced the happy news on Instagram Sunday, showing off the unique proposal he received from his love, real estate agent Tim Malone, with help from dogs Boomer and Barkley, reports the Daily Beast. “Daddy, will you marry Papa?” read engravings on the custom-made bowtie-shaped tags, which Newsweek reports Malone presented while celebrating his 35th birthday last Friday. “He gave me a present on his birthday. How could I say no?” Lemon captioned the post. It was just the latest romantic gesture between the couple, who memorably shared an on-air kiss as Lemon anchored CNN’s New Year’s coverage in 2018. Differing reports place the start of the couple’s romance at 2016 or 2017, but Newsweek reports Malone also has a media background. After studying journalism at Boston College, he worked at NBC News, USA Network, SYFY and even Billboard before making the move into high-end real estate in New York City, where the couple is based. No word on a wedding date, but with a roster of friends and associates like Lemon, it’ll no doubt be a star-studded affair. Congrats to the happy couple!